Last week I gave you my impression of the Craftsy class, "Color Play" with Joen Wolfrom. (Today is the last day to sign up for the Craftsy Giveaway, and winners will be announced here and on mmm! quilts tomorrow.) I showed you how it had changed my perspective of color, and in turn how I now picked out fabrics for a quilt. I really felt it would be incomplete if I stopped there, so I've started the actual quilt. Pop back to the "Color Play" post for fabric details, etc. I know it's quite vogue to cut out an entire quilt before piecing, but as I've said before, I'm old school. I would never, and in this case it's proven to be to my advantage. I only cut out enough at once to make a few trial blocks. I shamefully admit to having a nice stock of specialty rulers still in their shrink wrap. One of my goals in making this quilt was to to use at least one. I do think they improve your accuracy in cutting, and are often invaluable in squaring up. I started with a 60 degree ruler, and made a few blocks that didn't thrill me. I turned to this ruler next, and made the 5 at the top as a trial. Much more the idea I had in mind! *When using any triangle ruler as above, first sew your strips with an offset to conserve fabric. Now I cut out about 2-3 strips of each fabric I've chosen. The kaleidoscope block is an 8.5" block before sewing so all the strips will be 2.5". Even if I have extras left over, a 2.5" strip is easily incorporated into another project. The second day I started sewing again. This time I cut in a stack, and chain pieced as much as possible. It was a real time saver allowing me to work nearly twice as fast. In spite of it, I have to admit it was tedious making the same block over and over. I was already looking for ways to make this more fun. I snapped some pictures, and went home to rest and re-evaluate. One thing about the kaleidoscope block is the illusion of curves within angular piecing. I've roughly drawn it in above. The more I sat looking at the pieces, the more lines of curvature I found. These could be used to your advantage depending on the fabric colors, but I believe I've lost them in this quilt using the chocolate brown. I wondered if turning them on point would give it more of a Maltese Cross feeling. Resting and sketching, I've come up with a way to add interest to the project in my eyes. I'll see what fabrics catch my eye when I go in this afternoon, and keep you up to date. I hope you squeeze in some lovely Sunday sewing. I really like these blocks. Awesome. Certainly this is a great block for the fabrics you've chosen. They look wonderful. Yes, the curve is not hidden, but great idea for another colorway! So clever to use the ruler you've had sitting around. I have the same problem. Gotta get to those rulers! Love your fabrics. I alternated the colors of my corners - one block in light the next in dark. Gave it a lot mire circular movement when those adjouning 4 corners are not the same vale/fabric. Maybe try sketching more blocks on the same page to get better feel for the larger pattern. You are doing a great job with the kaleidoscope blocks and your color choices are super. I've learned the only way to really control the design is to control the values. It's also hard to tell from photos. I did a 60 x 60 quilt by putting every single triangle on my design wall before piecing it. 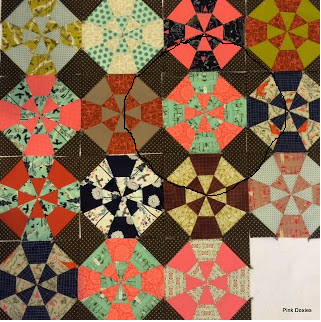 It's on my blog, Paula B Quilts at RSC15, week 52 post. Color is something we never stop learning about, which is so much fun. Your blocks are great! I try to always make some test blocks and if I don't, I usually end up regretting it! Thank you for your inspiration and linking Today Show and Tell Monday !! 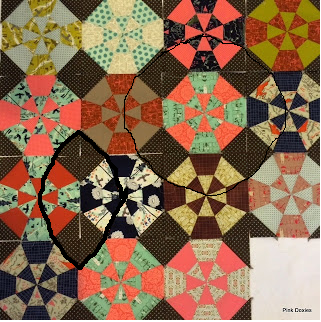 Yes, if you study closely, you will see that kaleidoscope quilts that really show that circular movement are arranged with alternating darks and lights. Yours sometimes have dark next to dark, which obscures the pattern. Love the colors, though. I agree with doing a test block first. Your quilt top is lovely. Great tips too. Why didn't I think to offset the strip sets!? Worth remembering for the future. Wouldn't it be fun to switch out two of your strip set pieces for a back ground fabric to make that football shape dominate? Love the blocks and Tokyo Train Ride! I just got me a bit of it last month. Chain piecing is the bomb isn't it!! I agree with everyone else too...that your color combination is perfect for this pattern. Thanks for sharing at Tuesday Archives this week.